Corel Painter Support, just announced a hot fix for Corel Painter 12.1. The fix corrects brush lagging after undo and flip canvas; issues with Real Watercolor Variants; and impasto information is maintained when saving as a RIF with embedded clone source. Please read the installation information about installing this hot-fix. I am so glad about this hot fix since I work primarily with real watercolors. OK…gotta go and install the new hot fix. Thank you bunches Corel Development Team. PS: I thought I would post a quick watercolor I did just so you know that I am still painting. Hope to post a tutorial very soon. This entry was posted in Skip Allen & Painter 12 and tagged Corel Painter 12.1 Hot Fix, Corel Painter Hot Fix, Skip Allen and Painter 12. Bookmark the permalink. OOh I wonder if it will stop me crashing when I use Real Watercolours, which has been happening less and it’s probably my computer…but certainly worth a try! Thanks for the heads up! Hey Joan, The information on the hot fix does say that it fixes the issues with Real Watercolors. Look good so far to me. Skip thanks so much for the heads up on the hot fix. I’ve already installed it. By the way, what paper did you use on the pine tree above? It looks great! I got that paper from Tim Shelbourne…actually I got the a copy of a photograph that he did of a “real” watercolor paper. I made a paper of it and a pattern. What you are seeing is the pattern at the top of the layer stack. Tim did the same thing in a Photoshop class and I always try to see if we can do the same thing in Painter. This one worked wonderfully. Are you in Open Studio – Street Scenes? If so, in the first live session I demonstrated the process. No zipped brush categories will work in Painter 12. You must unzip them first and then install. Thanks Yogi! I love positive feed back. Thanks for visiting the blog…hope you come back when you can. Why can’t I import and export painter 12 brushes between work groups? 1. Open Painter and select Skip’s watercolor workspace. 2. Go to Brushes > Export and select brush, brush category or bursh library. Then choose what I want to export and hit enter. 3. A box will open and I navigate to some place I want to keep my exports on my hard drive. I have a folder in my documents called Painter Stuff and I place copies of all my painter stuff there. Once found, click export. 4. Now I switch to Skip’s Started workspace and go to Brushes > Import and select the type of import I want. 5. A box will open…navigate to the place where you exported the file in step 3. 6. Select the file and click import and your brush, brush category, or brush library will install into painter. Thanks for the news about the hot fix. I’m glad you are enjoying the blog and thank you for making a comment. We were all a newbie once; sometimes I still feel like I am a newbie, too. Painter has so many features, I am constantly relearning. Your are most welcome for the tutorials. I hope you keep visiting. Thanks for the heads up Skip. First heard about the Hot Fix here! I had been noticing significant brush lag, but now it is gone – yay! However, I note that there is still a lag when using the eraser tool – do you see the same? The best place to find out about new stuff is Corel Painter FB page. That is where I saw the announcement. I just happened to hit it at the right time. I announced 49 minutes after the announcement on FB…LOL. It doesn’t really matter; all that matters is that we find out when the fixes appear. I am not experiencing a lag when using the eraser tool. I tried using undo a few times to see if that would affect it, but my eraser tool and other eraser variants work fine. Does the lag happen while you are doing a specific thing or does it happen all of the time. If you can tell me what you were doing when you experienced the lag, I can try to duplicate. I was painting on a layer with the Soft Vine Charcoal brush (love that brush!!). If I then choose the eraser tool, it works fine while you are erasing but then when you stop (ie. lift your pen off your tablet) there is a short pause before the cursor moves on. I guess in that sense it is not a real lag. It’s not really an issue for me as I hardly ever use the eraser tool, unless sketching or tidying up blends etc. But I thought you and others might want to know. Thanks for giving me more details. I’m not able to reproduce the same results. I’m glad it isn’t a real issue for you. BTW, if you do find a bug, there is a forum at Painter Factory to report the issue. The developers watch that forum closely. Thanks for the post, Skip. Downloaded & installed. That’s good news Audrey. I know you will like the fix. Thanks Skip. I found it ready when I brought Painter up this morning and then found your blog post. 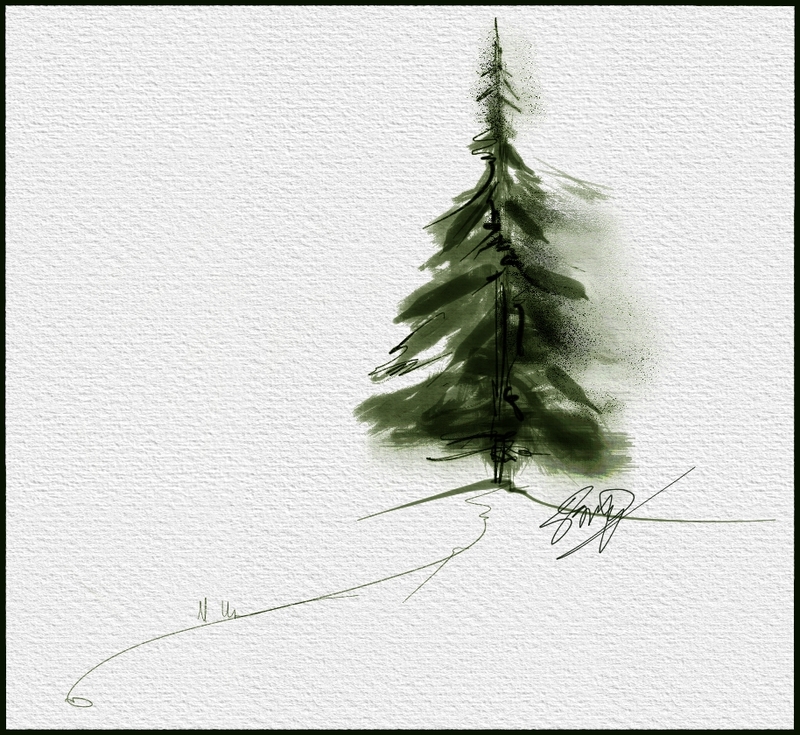 Love your free flowing watercolor pine tree. You have your software set to remind you of updates, which is the best thing to do I think. Good for you!!! Thanks for the comment on the tree. I’m trying to find time to paint; it isn’t so easy these days. I love what you have been doing in Open Studio. Well, Corel finally got me Skip … The program has crashed maybe 2 or 3 times since I purchased it last June??? … installed the new update .. and in the past 30 minutes .. it’s crashed 3 times for me .. using your watercolor brushes … needless to say .. to heck with Corel .. and it’s back to Photoshop. Love your beautiful pine tree kiddo .. but sure can’t say much for Corel’s update! LOL! I’m so sorry you are having problems. I haven’t heard others having the same problem, but I haven’t been on the computer much in the last couple of days. Let me ask a couple of important questions. 1. Prior to loading the hot fix, had you loaded SP-1 and then Painter 12.1? 2. After loading the hot fix, the first time you open Painter you need to open with a shift start and select all workspaces. Did you do that? 5. Install hot fix and open with a shift start all workspaces. Close Painter. Now open Painter and import your workspace and you should be good to go. If you answered no to number 2 only, then be sure you have your workspace saved or all your custom stuff and restart Painter with a shift start all workspaces. That should get you up and running. I hope so. Yes, service patch 1 had been installed. I think did this hot fix .. and no, did not open with shift, start, select all workspaces … I have no saved workspaces. The only workspaces there are the ones that came with the program Skip. Now .. I am extremely hesitant to uninstall the program because of the fact that they couldn’t get it installed in the first place! .. it took tec support a couple of hours to work around it all ..I had purchased Painter 11 and then purchased 12 via the internet. Did the download, the install and nooooo go. Went on line with them and there was absolutely nothing they could do to install the program Skip .. and they ended up taking control of my computer and they installed a full version of the program directly from their facility … so, I would have to first, find my cd of 11 .. which I don’t even think I have any longer … install 11, open the upgrade files, install the upgrade .. and then, I know it won’t work anyway … and, I don’t have the version that the tech guys installed .. and Corel did not send a hard cd to install from .. all I have is that lousy download version from the internet that didn’t work. I think I am caught between a rock and a hard place … and have to say that I now understand why so many people are so disillusioned with Corel .. it’s such a great program that it’s a shame. No idea what to do at this point. I forgot about your flu; I honestly thought you would be over it by now. I hope you feel better soon. About your note, you wouldn’t have to install Painter 11 again…so forget that. You are working in the default workspace and everytime you do anything in that workspace…add brushes, make a palette, whatever, the program remembers it and the next time you open Painter the default workspaces opens with your changes. A shift – start means that you hold down the shift key and while holding down the shift key you click on the Painter 12 start icon…keep holding the shift key down and instead of Painter opening, you will get a dialog box that gives you two choices…one sets all workspaces and the other sets only the current workspace to the factory default. You would select all workspaces. That means the next time you open Painter, you will have a clean install, but you will not have any of your custom stuff. The easiest way to save your workspace is to go to Window > Workspace > Export and export the workspace to some place on your hard drive that you can find later. Then once you have installed Painter 12 again, you can then import your workspace back and you are good to go. You mentioned that you installed SP-1 but you didn’t say anything about Painter 12.1, which isn’t a patch but an upgrade. If you didn’t install that, then yes, you would have problems. The documentation said to be sure and install both SP-1 and 12.1 prio to installing the hot fix. I think we can fix this…I’ll send you an email and maybe when you feel up to it, we can do a quick meeting and I think I can get you back up and running. LOL…maybe…I think I am remembering you are on a MAC…yuck…my nemesis! NOooooooooooooooooo .. no Mac! Yuck! LOLOL! Thanks so much Skip … will give a hoot and a holler when I feel I am up to this .. just fixed some soup and am headed back to bed. Anyway .. I’ll let you know when I’m better and then you can look at when it’s convenient for you. Not just gold, silver and copper reflection maps – I’ve just been experimenting with other coloured maps – and they make other text interesting. Now for some shapes – then onto brushes – I just love playing with ideas – before I plan the image that is. Me too. I made reflection maps in jewel colors that are fun to use. I’m not as smart as you…I tend to experiment right in the middle of a painting and ruin lots of them…but it is still fun. I’m so glad to see someone is playing with the ideas. What a lovely and what a friendly telling some things about the job, has been done…. Especially must say, your laughings made me so happy and feel myself just listening some one in my family…I liked all these videos very very much and also found so useful. Thank you very much, very very much Mr. Allen. Hello and thanks for dropping by. I am so glad that you enjoyed the videos. I love the idea that we are all as one big happy family talking about Painter. I hope you come back often. BTW…please call me Skip, everyone does. Hi, I’m new to painter & trying painter 12 out before I buy. I think it’s an awesome program & I can see all the possibilities using it. My brushes lag terribly. I am using Windows 7 with 6.00 GB Ram, processor is AMD A4 3400 APU, 2700 Mhz 2 core. Is my computer up to the task of running painter? I use photoshop without any problems. Do I need to get some more memory? Love your site, very informative & hopefully I can fix this to be able to use Painter 12. Thanks for any advise you can give me. There is a world of difference between Photoshop and Painter when it comes to brushes. Painter’s brushes are more dynamic and require more processing power. If you have Photoshop CS6, some of the brushes are more dynamic and with those you may experience brush lag. This is my personal opinion, but I think you can use Painter with your current configuration, but as you see, you will experience brush lag. I believe your system is at the low end for Painter. I think you would be better off with more memory and a much better processor. You have seen me paint in the videos and you probably notice that I have very little brush lag. It is because I have a good amount of memory and a much faster processor. I have 16 Gigs or RAM and my processor is an Intel i7 3960x @ 3.9 GHz. It has 12 cores. All this computing power doesn’t come without costs. Do you need something as fast as my machine…no, you do not. But I think you would be happier with something between yours and mine. What that may be, I cannot say. When I am buying a new computer, I set a budget and then I buy the best I can afford at the top end of the budget. I usually go a little over budget. But, by doing this, my computer has a longer life before I need to upgrade. More memory will help, but you may be limited with how much you can get. My previous Windows machine topped out at 6 Gigs of Ram. I wish I could tell you more, but I suspect you are at the point where a new machine is in order. Thank you Skip. I appreciate your reply. I can top out my machine at 16 GB of ram which I may try before buying another system. Painter has me hooked – I want it!! Thank you for your help! Do try the 16 Gigs…you can always take them out and put in another machine.